A couple of month’s back I was invited to attend the launch of the Samsung Galaxy S Captivate and Samsung Galaxy Tab. Although the party was awesome, I didn’t get a chance to see the products in action at the party. The lovely people at Rocket XL, hearing that I didn’t get a chance to try them out, were kind enough send me the Samsung Galaxy S Captivate to try out for a just over a week. I’ll admit I’m an iPhone guy and to try an Android phone was exciting to me. I’ve heard such great things about the Android phones from some of my colleagues at the office that I had to really give this mobile phone a good run. 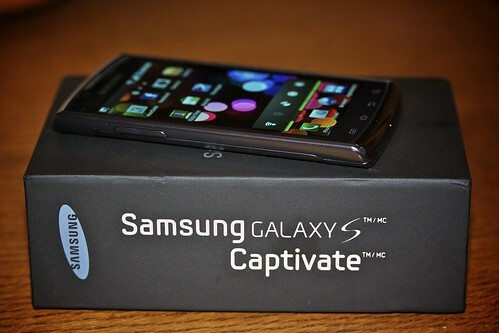 I replaced my iPhone with the Galaxy S Captivate and this became the main form of communication for me during that time. I’m going to keep this review as simple as possible and avoid getting too technical. I think the average person will be best served this way. I’ll try to avoid comparing it too much to the iPhone as this isn’t the intention of this review. Right out of the box the phone has a great sleek look to it. Coming from an iPhone, I had to get use to having the ON/OFF button on the side of the phone instead of on the top. This was hard to get use to for a few days as I would always go towards the top of the phone. Once the phone was turned on I was amazed at the size of the screen. It was wonderful to look at a phone with such a great size screen. The default wallpaper was a gorgeous European street scene and made me want to just get on a plane and travel there (ok that is for another review ? ). There were 4 separate buttons on the bottom of the phone, your settings (depending on which application you were in I figured out ), the Home button, the Return button (usually moves you back to your last screen), and your Search key. Pressing any keys would cause the phone to vibrate to let you know that the key was pressed. I then quickly moved onto the Android Apps. I’ve heard great things about them and I wanted to test drive a few of them on my own. The first App on my list was HootSuite. As expected there wasn’t any difference to using the App itself. What was different with using an Android Apps was where the Apps are located and stored. You have to actually go in the Applications button to view all Apps, but the interesting thing is you can move them to any Home screen afterwards. Ok now for what I truly liked about the phone itself. Being an amateur photographer I quickly had to try out the 5.0 Megapixel camera. The cool thing about the camera was that it offered you preset settings like most point and shoot cameras do. There is a setting for Macro, Landscape, Action, Candle, Fireworks, Backlight, etc. Who would need a point a shoot with these settings. All of my Vancouver Christmas Market photos were taken with this phone. As stated earlier the screen size is bigger than my current iPhone 4. Though not as crisp in my opinion, it still was great to be able to have a great size screen to view websites, watch videos, and even use for taking photos. Great push content, from emails via Gmail or Exchange, my notifications was quick and easy. Also once I was signed onto Twitter view HootSuite, anytime a Tweet would come in for me, I was notified on the phone. A great feature I thought. Loved, yes LOVED, the fact that you could turn the phone into a wireless hub and have up to 10 other wireless devices hooked up to the phone and using the data plan. Warning this does drain the battery very quickly. The initial set up was cumbersome. By default the auto correct on the keyboard wasn’t set up and I had to find it through the Settings to turn on. This in itself wasn’t easy to find and I found click through too many screens to make it happen. Once the auto correct keyboard was set up, I still found that I would have to correct the corrected words far too often and really slowed down my productivity when responding to emails, Tweeting, or even searching the web. Even though I loved the camera, the lack of a flash in this day and age was disappointing. 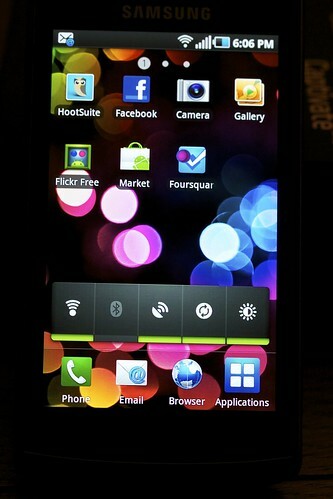 Even the Samsung Galaxy S Vibrant (its predecessor has a flash). Lack of a front facing camera was disappointing. As per the same comment above about the Flash, the Galaxy S Vibrant has a front facing camera. Most of the Android Apps that I wanted were actually paid Apps. Even though the iPhone version was free, the Android version had a cost associated with them. Though this isn’t due to the phone itself, I was disappointed to see that from Android. Deleting an App was very time consuming. From my Home Screen when I dragged the App to the bottom of the screen, which reveals the trash can, the App actually doesn’t get deleted, but is just removed from the Home Screen area. To delete the App itself, you have to go into your Settings and follow about 4 steps to actually “uninstall” the App. No software to hook up to my computer within the box itself. I found out that I couldn’t just hook up the USB to my computer to get my contacts and calendar to sync. I even tried going to the Samsung’s webpage to see if I could download some software, but I couldn’t easily find any and since I only had the phone for a short period of time I didn’t continue to search for it. I also wasn’t able to install any music on the phone to test out that functionality due to the same reason above. Battery life wasn’t the greatest and found out that I needed to recharge the phone after 12 hours of use. Granted this could have been because of the push content, or the fact that I was using the phone more than normal thus draining the batter. Once I had all the settings to my liking, which took about 2 days or so, it was actually a nice phone to use. I started to understand the Android OS and was able to quickly maneuver myself around it quite nicely. I did find the phone to be a little wider than my iPhone, though not a huge issue for me, it might be an issue for someone with smaller hands. I was sad to see the phone go away. I truly liked the camera settings the ability to have mini wireless hub created with just one phone. For me these were two of the biggest selling points. I think it would be great to have someone be able to create a phone that has the ease of the iPhone and some great features the Samsung Galaxy S Captivate. Here in Canada you can currently get the Samsung Galaxy S Captivate through Rogers for as little as $99 on a 3 year contract or $549 on a no term contract. Psst… it’s Captivate, not Captive. 😉 They’re not holding you prisoner. HOLY CRAP! I’m such an idiot and have corrected it within my post. I am considering the pros and cons of the Samsung Vibrant and the iPhone. This adds a nice bit of information to my decision-making process. My colleague has the Samsung Vibrant and was able to show me a few “tricks”, but he liked the Captivate much better. Granted his Vibrant has the front end camera. What he doesn’t like is the speed of the Vibrant and thought it was way to slow for his liking when compared to the Captivate. Great review of the phone. I’ve had it for a few months and love it. Regarding not being able to drag to delete apps – you actually can do this (although maybe not with the default launcher that comes with the phone). On Android you aren’t stuck with the manufacturer’s software and a popular launcher is called Launcher Pro you can download for free from the market. If you use this launcher you can drag apps into a trash bin along with a lot of other neat customizations that aren’t available on the Samsung launcher. Regarding software, none is needed. You just use the usb to connect to the computer and drag-and-drop to any folder on the phone. If the drive doesn’t show up on your computer you need to go to the notifications on the phone and ‘mount’ the drive. Also if you use gmail, your contacts will sync automatically from your account (under Settings > Accounts and Sync). Ok, I feel like I’ve defended my phone enough now haha.